Play Nile Online Free Now! Simply create an account. Immortal Cities: Nile Online is a free to play persistent browser-based empire and city building game set in ancient Egypt. 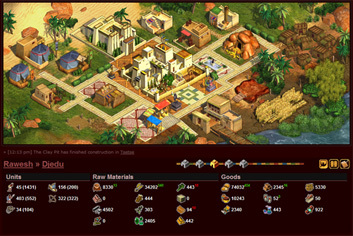 Play with thousands of other players as you construct cities and monuments worthy of your legacy as Pharaoh! Nile Online is casually paced; it's something you can play throughout the day, minutes at a time. The game is free to play and there is nothing to download or install - within seconds you're commanding, tweaking and growing your empire from anywhere that you have access to the internet. Theoris: 2,367 ships sailing the Nile. 1,290,597 laborers working. 78 buildings upgrading. 309 market sales (past day). Sabah: 0 ships sailing the Nile. 529,959 laborers working. 14 buildings upgrading. 2 market sales (past day).